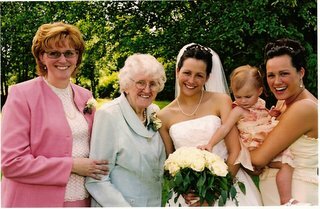 Up to the time this picture was taken, all of us were living together - four generations in one house. It was an awesome time - much chaos and far more hormones than should be in one house at the same time! My mom looked so lovely at Sheena's wedding. 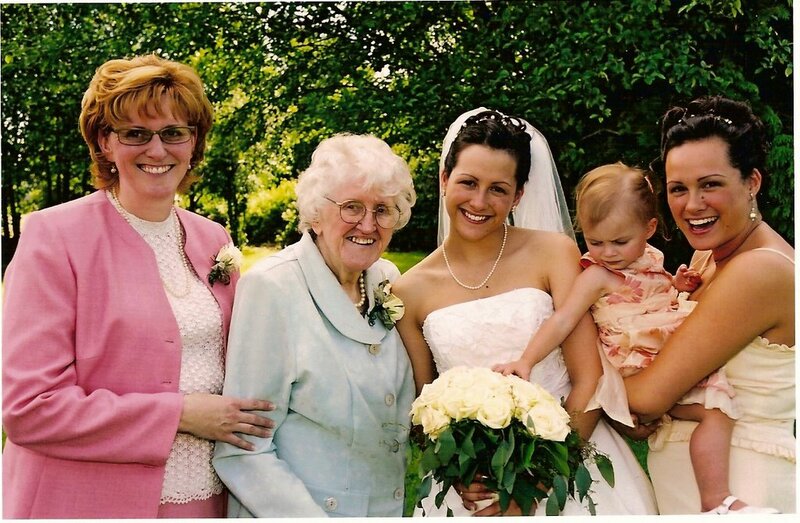 It was our first child's wedding - grandma's first granddaughter getting married. It was a wonderful and magical day. We put this picture in an album, along with pictures of all our family members, to help my mom remember. She keeps forgetting who she is and who she belongs to. She keeps thinking that the nurses are family members and the other women in the room confuse her - she wonders who they belong to. So she's looking at her new photo album reading out what we've written about who everyone is. It seems like new information to her sometimes, but other times, it's like she knows it fine. One day she is confused, another day she knows what's happening and she wants to come home. That is the stressful part. The other part is, the poor woman can't hear me - her hearing aid broke. We've ordered a new one and it won't be hear fast enough for her! Today I had here TV hooked up so she can watch it. She's fascinated with it - like it's a new thing altogether. She can't seem to understand how to push the channel and volume buttons. Oh well... at least she'll have something to amuse her. I thank God that up until just a few weeks ago we had my mother with us totally knowing where she was. It was a wonderful blessing to have her at Sheena and Sarah's weddings. Well, actually she missed Sarah's wedding at the church, but that's another story! I love this picture with my mom. Thank you, Lord, for my mom and all the wonderful memories I have of her. Hi Kathie. Your mom is such a loving woman. She made me feel loved and included. Praying for great grace for this stage for you. What an AWESOME Pic Kathy!! Beautiful Family!! !